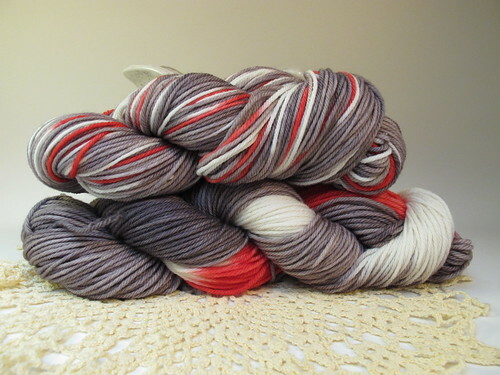 From the mailbag — Why do you reskein your yarn after you dye it? Doesn’t that take time you could be using for something else? 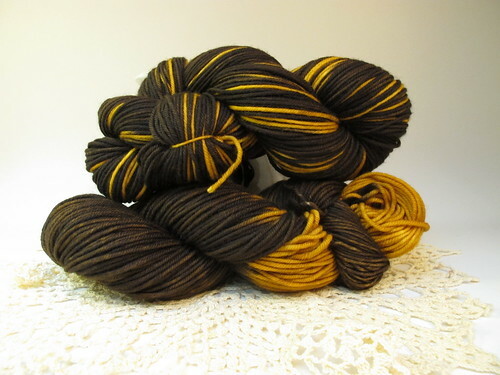 There are a few reasons I re-skein my yarn after dyeing it. One reason is neatening up the skein; one reason is showing a little better how the colors play together; one reason is to have a uniform size and shape for my products. The way I dye yarn, it gets moved around a lot. Adjusted on hangers as I dip-dye, massaged and mushed around as it’s soaking and I try to get the dye in all the spots, blown about a little as I hang it outside in the breeze to dry. Sometimes the ties aren’t all the same size, and they’re certainly not tight as I need them to be loose while dyeing in order to not get white spots (unless I’m trying to get white spots on purpose). So by the end of the dyeing process, when I’m ready to list them for sale, they sort of look like they have a severe case of Bed Head. Re-skeining evens out the yarn, tightens it up and brings everything in line — just like brushing your hair. I think this looks more professional than a big ol’ hunk a’ messy yarn, that someone would probably be afraid to try to wind. So I re-skein. 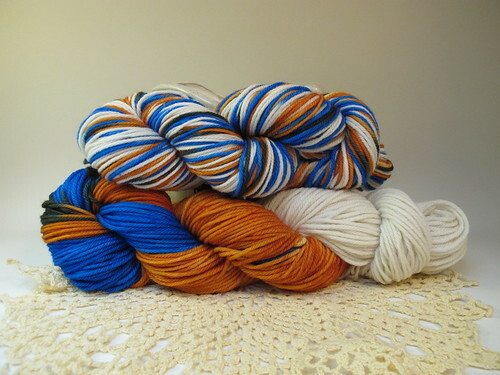 When two good friends and I owned a yarn store, we specialized in smaller, hand-dyed yarns. Not all of them re-skein their yarn (heck, it does take time! 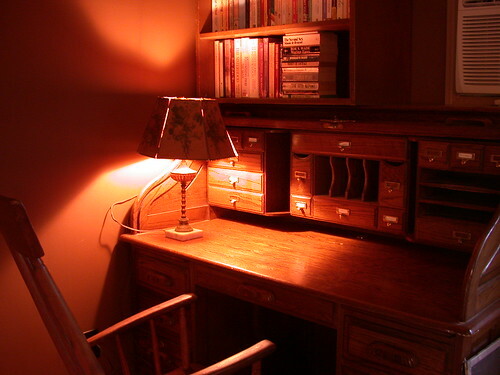 And when you’re trying to turn things around at a good pace, every minute in your workday counts). 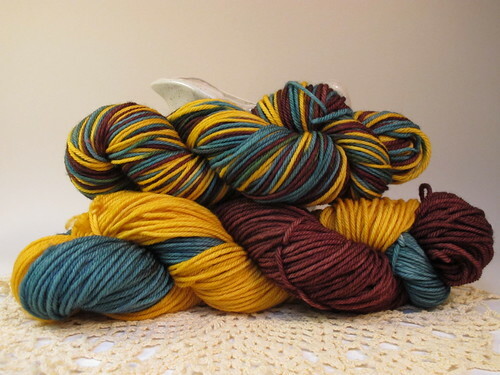 While I do love the way large chunks of color look together, like the bottom skein in the photos in this post, I don’t feel that the large chunks always give you an accurate representation of how those colors are going to play together when worked up. Most of the “I just can’t find the right pattern for this yarn, can you help me?” questions we would get at the yarn store were in regards to handdyed or handpainted yarn that wasn’t re-skeined. Some of the times I’ve spent the most time on Ravelry, pouring over FO photos trying to see how a particular colorway is going to work up, have been with handdyed or handpainted yarn. Not that that’s time I regret, mind you! Nothing like a good FO search to inspire you to add patterns to your queue or to get working on a particular yarn! But my desire to show off how colors are going to work together is stronger than my love of chunks of color together. So I re-skein. Also a holdover from the yarn store, even though I work at home now, I keep in mind how the yarn is going to look when displayed. While most of my sales are online, I do have the occasional wholesale yarn order, and do a couple of craft shows a year. At the yarn store, we did have some of the typical bins, but most of our yarns were displayed on slat-wall, hanging from hooks. It just – in my eye – looks better/more even/more planned when most of those yarns hanging are not willy-nilly but are evenly spaced. So if you have some yarns from the same vendor and they’re in 53″ hanks, but some are in 60″ hanks, your spacing can get off-kilter. Or if your hanks are lying sideways in a bin at a show, and they’re not all the same length, some of them can drape over and hide the other ones. 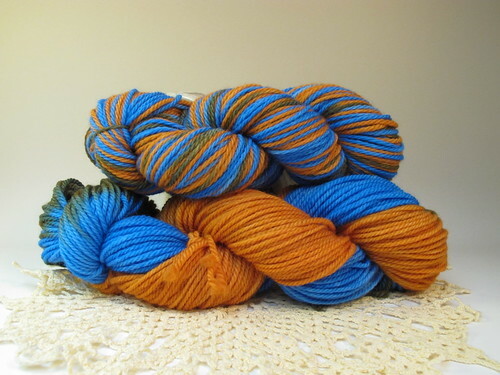 I prefer a more uniform look… so I re-skein. This is not to say that everyone SHOULD re-skein their yarn; it’s just what I choose to do because it works for me. Even with the extra time. Some other people might not abuse their skeins as much while they’re dyeing them, so by the end they might not be as messy. Or they might prefer the large chunks of color. Or they might not have the time. Whatever works for them! There’s room enough in this big ol’ world for all of us and all our myriad ways of doing things. TRUE STORY. Thank you Sensei . That is a good lesson.